When I heard about Look Again‘s ‘Refresh Rather Than Relocate’ Challenge, I knew it was rather up my street! We bought our house three years ago with big dreams of renovating it all – refitting the bathroom, kitchen and conservatory and re-decorating all of the other rooms. Sadly, time and money have meant that we’ve rather ground to a halt and are living with a lot of the bad DIY jobs and interesting décor choices of the previous owners! I must admit, the temptation has been at times to give up and buy somewhere different – somewhere a little newer with a little less textured wallpaper and wood cladding – but our budget would likely allow for only a one or two bedroom new property, rather than the three bedroom, conservatory and study we have now in our ‘project house’, so we’re determined to stay put and carry on working hard to make it the home we’ve always dreamed of. So, refreshing rather than relocating is definitely on the agenda – choosing stylish pieces that make a statement and help to bring a room together. 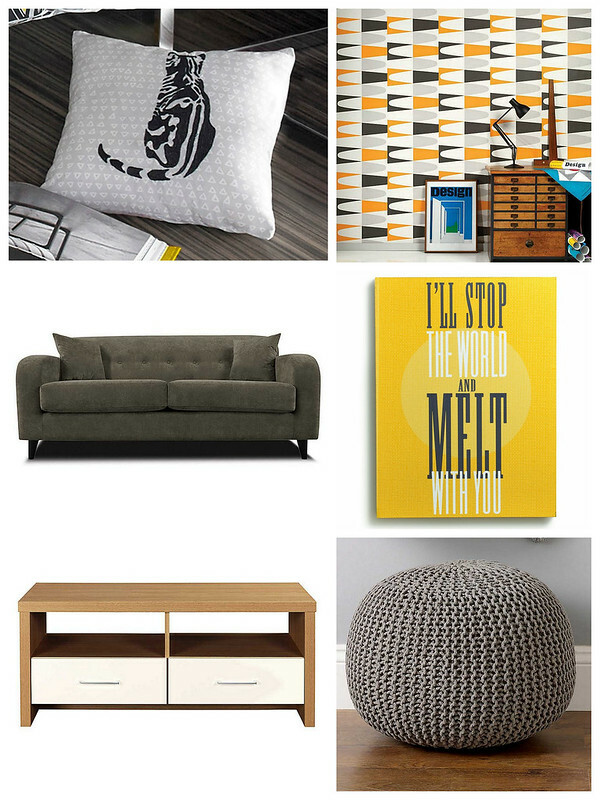 As you know by now, I’m a huge fan of retro, mid-century styling, and that theme has inspired most of the choices in our current living room. Although our living room is fairly ‘complete’ in terms of DIY tasks, it does have a lot of rather ‘mish mash’ items – the sofa from my previous flat, a lamp from my parents’ house, the coffee table from another flat repurposed as an entertainment unit – and very little that we’ve chosen specifically for our current home with a clear style in mind. 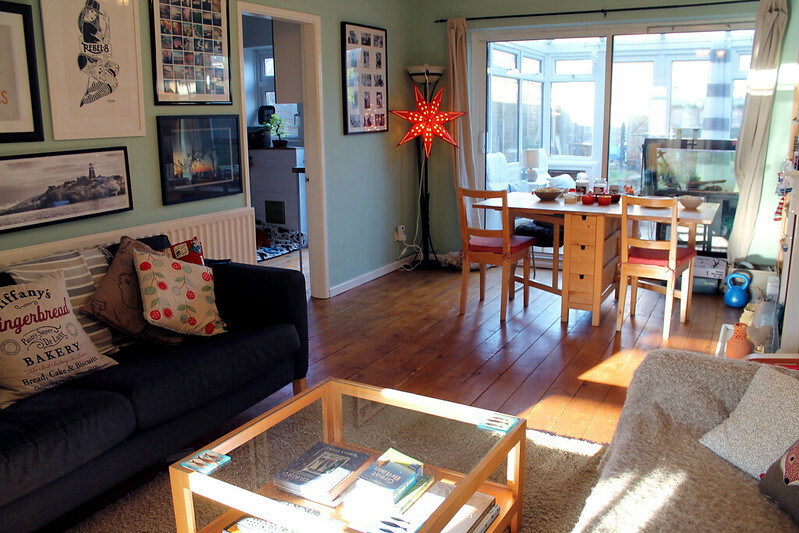 This photo is our living room as it is now – I do love it, but it could definitely do with a bit more steamlined style. I think it has every colour in the rainbow dotted around, piles and piles of cushions that don’t really ‘go’ and as I mentioned, a lot of furniture inherited from previous homes or friends and family. With the challenge of ‘how to revamp a room on a £750 budget’, I had a good look around Look Again for pieces that would really hang together and give our lounge the refresh it really deserves. I am already dreaming of what they would all look like in our home! My wishlist comes in at £726 – a small price to pay for refreshing our most occupied room! What do you think of my choices? That sofa really looks incredibly comfy – and long enough for Tom and I to both sprawl out during marathon TV sessions! I adore the funky Graham and Brown wallpaper, and that knitted pod looks perfect for coming home and plonking yourself on after a hard day at work. With most of us tightening our purse strings amidst a backdrop of rising house prices, estate agent fees and hefty deposits, refreshing rather than relocating definitely seems like a sensible option. Which room would you choose to refresh given the opportunity?